September in Adana always brings three things: slight relief from the soul-crushing heat and humidity, smoke wafting into the city from the farmers burning the surrounding agricultural fields, and, lastly, fresh salça. 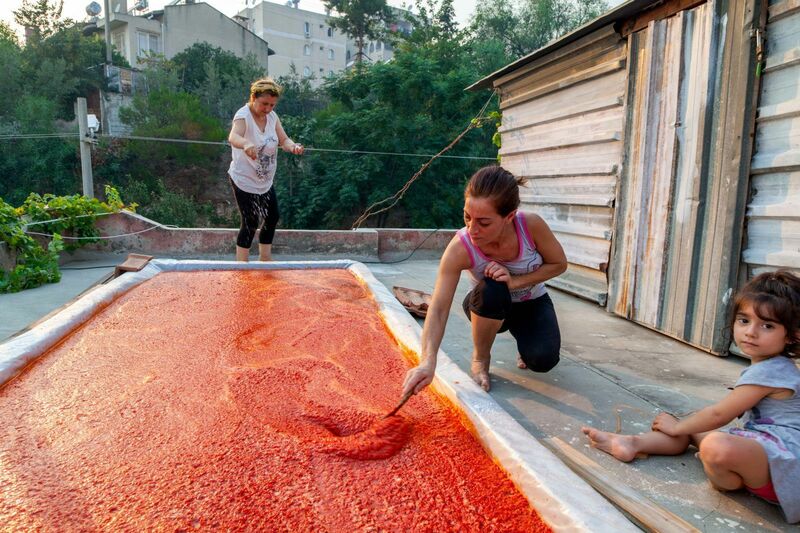 Salça (pronounced sahl-cha) is a red pepper paste that has been made in Turkey for generations, and Adana is renowned for it. All major roadways going in and out of the city are lined with little wooden shacks that sell this concoction. This year my family was invited to participate in the salça-making tradition. The red peppers used in salça hit their peak—both in quantity and quality—in September. Individuals flock to large markets that sell produce in bulk to buy piles of red peppers to make the spicy, salty mixture. This year our friends, Müslüm and Yeter, purchased 270 kilograms… Yes, TWO HUNDRED AND SEVENTY KILOGRAMS. Just under 600 pounds…of peppers. The peppers were delivered early the next morning and the work began. 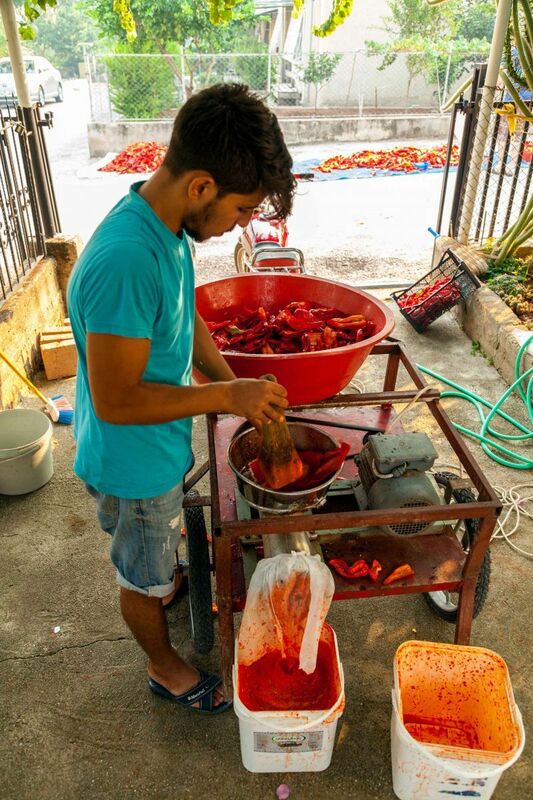 Each pepper must be cleaned, gutted of the ribs and seeds, and laid out on tarps in the street (the only place large enough to hold 600 pounds of peppers). This is by far the most time consuming step, but thankfully the entire family, and several neighbors as well, showed up to help. Next, the peppers must be ground. Because I had seen this done before, I was not surprised when a man on a motorcycle arrived, towing an industrial-size meat grinder affixed to a custom trailer. As he stuffed mounds of peppers into the top of the grinder, a bright red soup shot out of the bottom and into a bucket. Each bucket was then carried into the house, up to the second floor, and pulled up through a door on the roof with a rope. Six hundred pounds of liquid pepper are painstakingly hoisted to the roof this way, bucket by bucket. 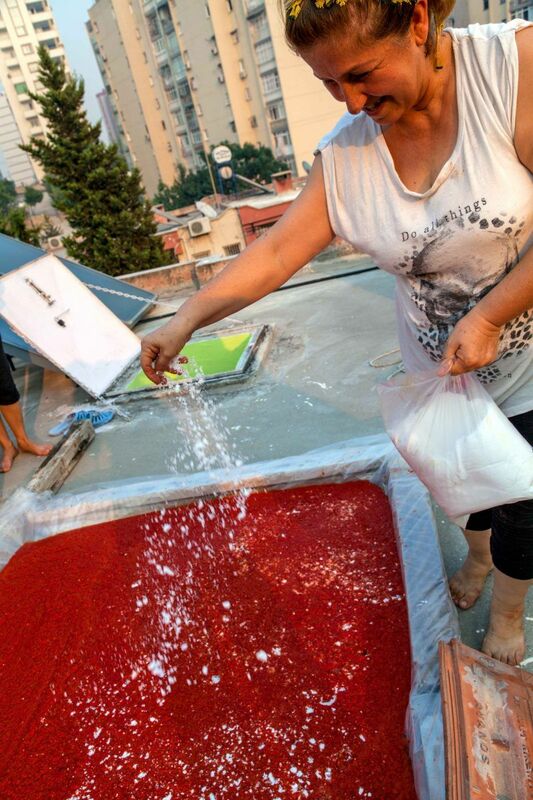 On the roof the peppers are poured into shallow tubs that Müslüm built using wooden boards and plastic tarps. These tubs will hold the peppers for the next two weeks as they transform from soup into pasty goodness. 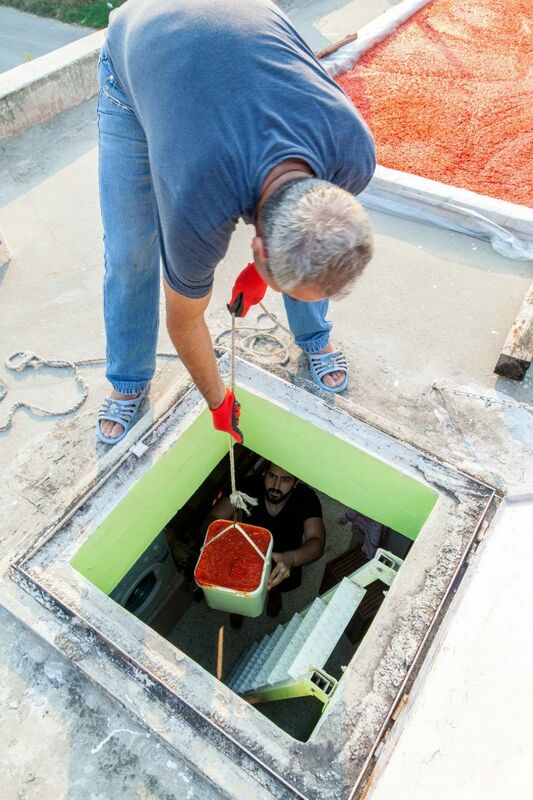 As we waited for his son, Deniz, to lug more buckets to the roof, I asked Müslüm more about this tradition. Growing up in city several hours away, he didn’t start this yearly salça-making ritual until after he married Yeter and moved to Adana. He explained that salça is made in different parts of the country using the different varieties of peppers special to each region. However, the soil and climate around Adana produce the perfect pepper—sweet and with just the right amount of kick—to make excellent salça. After the journey to the roof is completed, the pepper soup must be salted. Yeter dug her red pepper-stained hand into a 5-kilogram bag of salt and began scattering the powder over the top of the peppers. Like any good traditional homemade food, very little measuring is done. I asked her how much salt she would use and she replied with a smirk, “I know when it’s right.” The peppers will sit uncovered on the rooftop for 10-15 days, depending on the weather. If it is clear and sunny, the liquid evaporates quickly; but if it is cloudy, or if it must be covered because of rain, it could take over two weeks to dry. Every evening, someone must climb to the roof to stir the mixture, ensuring that all every pepper particle is sapped of moisture. Eleven sweltering days later, we were called back to Müslüm and Yeter’s home. The mixture had dried, but it must be ground again. After drying, the mixture is coarse and lumpy, not the desired consistency that can be mixed into food without changing its texture. The same man came back on the same 100cc motorcycle pulling the same trailer with the same grinder. 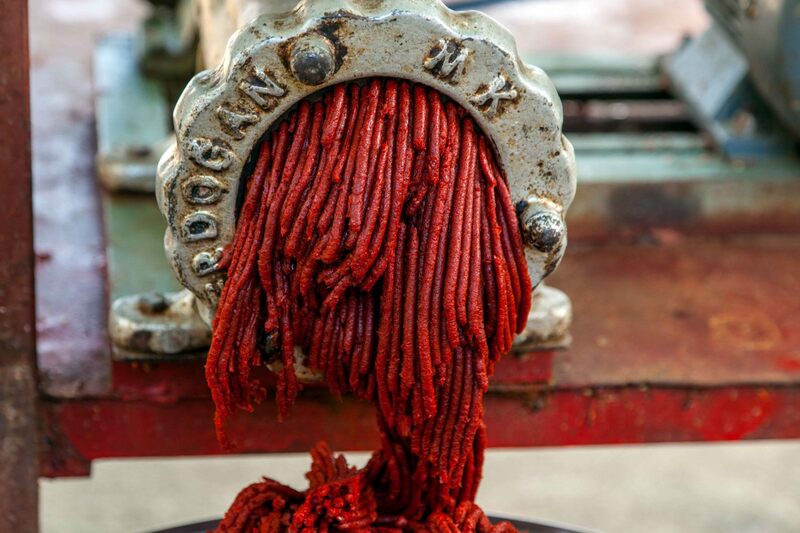 But this time when the paste was thrust through the mill, the mixture emerged smooth as silk, ready to play its part in making delectable Turkish dishes. 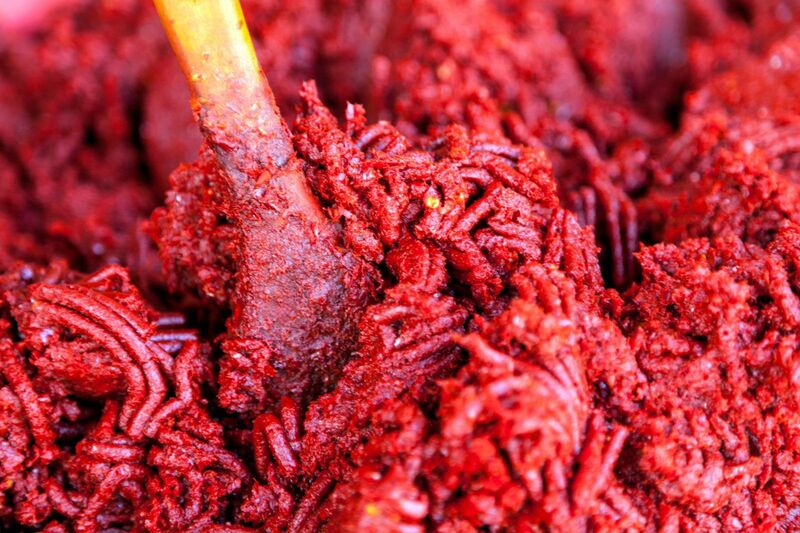 When all of the paste had been ground, everyone sat down for tea, staring at the mammoth pile of crimson gold. Each person voiced their estimate on the final haul. Deniz said it was 50 kilograms, while Müslüm argued that it was much less, maybe 35 kilograms. As each made their case, citing comparisons to harvests of years past, Yeter looked toward us and asked how much we wanted. We told her that we had yet to use up the 2 kilograms that she had given us 2 years earlier, the debate came to a halt and the entire family began laughing. “This won’t even last the entire year,” Yeter said. “We must do this again in a few weeks to have enough for ourselves and our relatives. How have you not used 2 kilograms in two years?” I thought to myself, “How do they use 50 kilograms in one year?” As we finished our tea we giggled at one another, but for very, very different reasons.